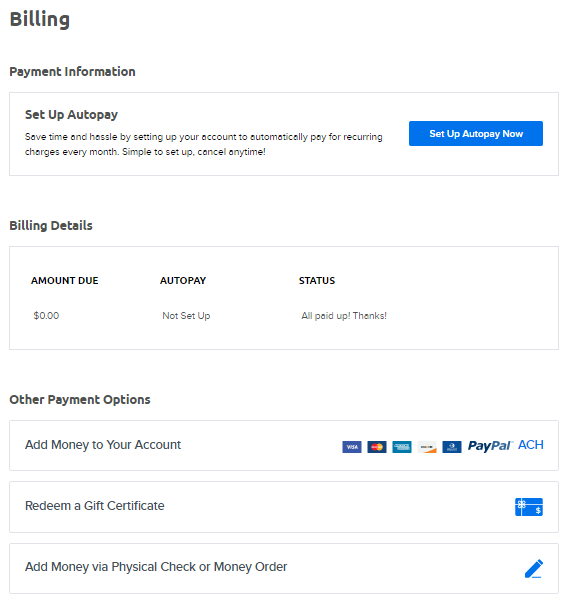 The DreamHost panel allows you to make pre-payments on your account, however the pre-payment does not apply to the charge or service(s) until it’s ready to renew. This means the pre-payment you submit will stay on your account as a positive credit balance until a charge/service becomes due. You also aren't able to define to which charge or service the pre-payment will be applied to; the next charge on your account automatically withdraws from the existing credit balance. Payments must be made through your DreamHost panel which offers a secure way to transmit payment data. What happens after I make a pre-payment? Once you make a prepayment using any of the above payment options, your account shows a positive balance on the Make Payment page with the amount you paid. The DreamHost charge appears as “DreamHost dh-fee.com” on your bank statement. What is the minimum payment I can make? How can I manage my Discussion List?